Synopsis (from the publisher): Stoneham, New Hampshire, is a haven to bookstores, including Tricia's own mystery shop, Haven't Got a Clue, but is sadly lacking in bed and breakfasts. Pippa and Jon Comfort's Sheer Comfort Inn opens its doors to the public in a week and the couple has offered some locals a free night as a trial run. 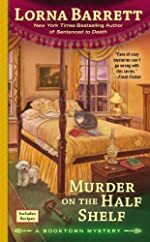 But what should have been a pleasant overnight stay for Tricia becomes a nightmare when she makes two startling discoveries: Pippa's murdered body in the backyard, and the fact that her husband Jon is actually Harry Tyler, a man Tricia loved—and believed dead—for nearly twenty years.